Seffa Medfouna is a famous Moroccan dish which features saffron chicken, lamb or beef hidden within a dome of steamed couscous or broken vermicelli (chaariya). The couscous or vermicelli is sweetened with raisins, butter, and powdered sugar and decorated with ground fried almonds, cinnamon, and additional powdered sugar. Seffa may be prepared without the meat (see Sweet Dessert Couscous) and served as a follow-up course to the entree. Both are popular on holidays or when entertaining. How to Make Seffa Medfouna shows how to steam vermicelli and arrange the dish for serving. If making this dish with couscous, see How to Steam Couscous. Also, see How to Fry Almonds. Fill the base of a couscoussier with ample salted water, and bring to a boil over high heat. Reduce to a simmer, and proceed with steaming the couscous three times (add the raisins for the final steaming), or the broken vermicelli four to five times (add the raisins for the fourth steaming). If unfamiliar with this process, follow steaming directions in How to Steam Couscous or How to Make Seffa Medfouna. While you're steaming the couscous or broken vermicelli, also prepare the meat. Mix the chicken, lamb or beef with the onions, spices, butter, oil and cilantro in a Dutch oven or heavy-bottomed pot. Gently brown the chicken or meat over medium heat for about 10 minutes. If cooking chicken, don't add water as the chicken will braise in its own juices. If preparing lamb or beef, add enough water to just cover the meat. Cover the pot and cook over medium heat, stirring occasionally, until the meat is very tender. This will take about 1 hour for the chicken but may take longer for the lamb or beef. Avoid scorching the meat, and add a small amount of water to the lamb or beef during the cooking if necessary. When the chicken or meat has been cooked, reduce the liquids until a thick sauce has formed. Discard the cinnamon stick, and taste for seasoning. If desired, remove the chicken from the bones. Gently toss the steamed broken vermicelli or couscous with the butter and powdered sugar. Place about 1/3 of this mixture on a very large serving dish. Arrange the chicken or meat in the center, and cover with the sauce. Pile the rest of the couscous or vermicelli on top of the meat, using your hands to shape a dome. 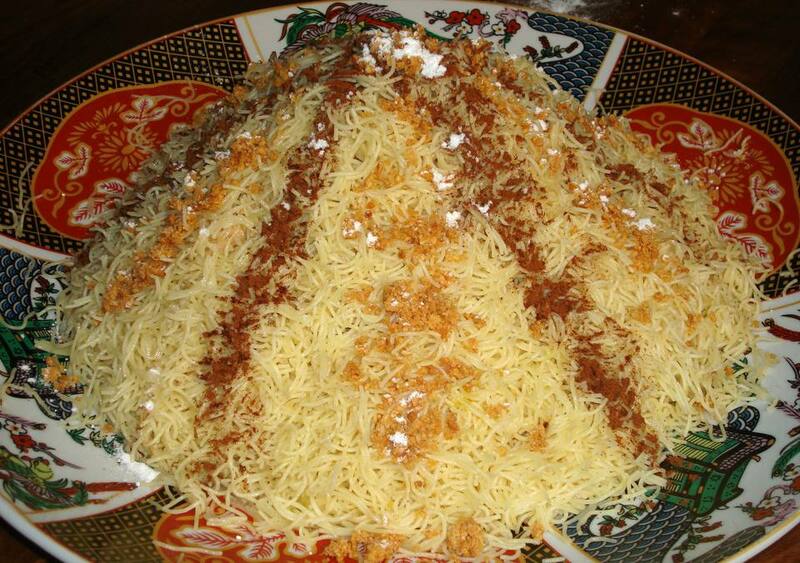 Decorate the mound of seffa in a vertical pattern with the cinnamon, ground almonds and powdered sugar. Serve immediately, with small bowls of powdered sugar, ground almonds, and cinnamon on the side. It's Moroccan tradition to gather around a single plate of Seffa Medfouna, with each person eating from his own side of the dish and adding additional almonds, cinnamon or sugar as desired.